Core curriculum: Republican Congresswoman Virginia Foxx’s higher education bill, the PROSPER Act, is a wish list of conservative priorities. On December 12, 2017, a long line of lobbyists, advocates, and reporters began to form outside a stately hearing room in the Rayburn House Office Building in Washington, D.C. Inside, Representative Virginia Foxx, a Republican from North Carolina, was preparing to launch one of the most important acts of her tenure as chair of the House’s education committee: a comprehensive rewrite of the law governing the American system of higher education, the Higher Education Act (HEA). A former community college president herself, Foxx had ideas about how to guide the nation’s sprawling collection of colleges and universities and the enormous federal student aid system that keeps them afloat. Now, for the first time, she was going to fully reveal her plan to the nation: H.R. 4508, the Promoting Real Opportunity, Success, and Prosperity Through Education Reform (PROSPER) Act. It had been nearly a decade since the HEA was last reauthorized. In that time, American higher education had witnessed an economic crisis that devastated state funding for higher learning. Student debt skyrocketed, the for-profit higher education industry cycled through scandal and collapse, and small liberal arts colleges began disappearing from the map. At the same time, a relentlessly competitive labor market was making advanced skills and credentials more essential than ever before. But in recent years, a comprehensive rewrite that would respond to these changes had taken a back seat to a crowded legislative agenda and tumultuous politics in Congress. The Senate had yet to produce its own proposal this term, and that created an opening for Foxx to plant her legislative flag first, setting the agenda for everything that followed. Foxx began the committee meeting by invoking the idea of “lifelong learning” as the “root of all innovation,” which, she said, is needed for prosperity and to fill six million jobs that American employers can’t fill at the wages they’d like to pay. She then blasted colleges for continually hiking tuition. “Today, Americans carry more than $1 trillion in student debt,” Foxx said. “College costs continue to surge, leaving millions of families to pay the price for well-intentioned but poorly executed federal involvement.” The HEA didn’t just need to be reauthorized, she said. It needed to be reformed. Despite their ever-widening differences, Republican and Democratic lawmakers have something in common: both parties are beholden to the colleges and universities that provide jobs, economic development, and social capital in their home states and districts. Sitting next to Foxx was her Democratic counterpart, Robert “Bobby” Scott, whose district contains Hampton and Old Dominion Universities, among others, and who was the first African American U.S. representative elected from Virginia since Reconstruction. Himself a graduate of two of the nation’s finest colleges—he received his bachelor’s from Harvard and his law degree from Boston College—Scott was mindful of the HEA’s origins as a pillar of Lyndon Johnson’s Great Society. “The promise of the HEA has eroded, and for far too many of our students, access to economic opportunity provided through higher education is now out of reach,” he warned. As other committee members offered testimony, the battle lines became clear. Foxx and the Republicans wanted to deregulate the industry, reduce or eliminate federal subsidies, promote private-sector competition, and make higher education more responsive to the needs of business. Right-wing media stories portraying today’s college students as coddled and entitled and college administrators as leftist enemies of free speech added to Republicans’ sense that the system was badly in need of reform. But as skeptics of any kind of federal intervention, they were trying to figure out how to upend the higher education system without actually passing a law that would require states and colleges to take real action. Democrats, by contrast, called for a renewed crackdown on predatory for-profit schools. With respect to traditional public and private nonprofit colleges, they were more sanguine, mostly focusing instead on expanding federal financial aid programs to make those schools less expensive. They, too, were reluctant to pursue strong new federal policies aimed at holding accountable those colleges with low graduation rates and low rates of student loan repayment. Despite their ever-widening differences, Republican and Democratic lawmakers have something in common: both parties are beholden to the colleges and universities that provide jobs, economic development, and social capital in their home states and districts. Many members of Congress are proud alumni of their state universities and give great deference to college presidents who lobby against regulation. The higher education lobby is a formidable force for preserving the status quo. The movement to reform higher education is also facing a headwind in the form of Education Secretary Betsy DeVos and the Trump administration, who have launched an aggressive deregulatory agenda, effectively giving away the store to for-profit colleges while starving the U.S. Department of Education of the staff and resources it needs to monitor a system that serves twenty million college students every year. DeVos’s desultory enforcement of the Every Student Succeeds Act (ESSA), which President Barack Obama signed into law in 2015, has already become one of the biggest barriers to moving HEA forward. As the HEA is to higher education, ESSA is to K–12 education, and it represents one of the last major bipartisan compromises on a comprehensive piece of education legislation. So Democrats point to the Department of Education’s mishandling of ESSA implementation as a reason their Republican opponents can’t be trusted to negotiate a deal on higher education. With virtually no House Democrats willing to support her legislation, Foxx has to rely on Republicans to get to the needed 218 votes. All indications are that the votes aren’t there, so the bill has yet to be brought to the floor. Things are even worse in the Senate, where Foxx’s counterpart, Lamar Alexander, Republican of Tennessee and the powerful chairman of the Senate’s education committee, has held three hearings on reauthorization but produced no bill. Over the summer, he effectively threw in the towel, announcing that the Senate would not take up the reauthorization of the HEA this year, given political differences within the chamber. As the November midterm elections draw near, the chances of passing an HEA reauthorization approach zero. But even if there will be no vote this year, the fight over HEA reauthorization so far has clarified the issues and battle lines that we are likely to see next year when a new Congress, with possible new leadership in one or both houses, takes up the challenge. So what follows are the highlights of the fight so far, and a road map for what’s still to come. For decades, Washington offered U.S. colleges and universities a sweet deal. In return for about $150 billion a year in federal subsidies, institutions have been asked to meet only the lowest of bars. Washington does not require them to, say, boost graduation rates or recruit more lower-income students or even prove that their students are learning anything. The money just flows out, with virtually no accountability for results. That began to change a bit under Obama. 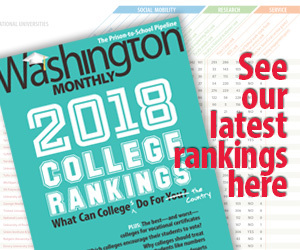 While his administration fell short of its proposal to create a federal ranking system for college performance and ask lawmakers to tie federal funding to it, it did push through a number of tough regulatory changes. These include a “gainful employment” rule to cut off federal aid access for low-value certificate and for-profit programs, a “state authorization” rule that requires colleges to meet any state requirements to offer online courses, and a rule designed to provide relief for borrowers who were defrauded by their (overwhelmingly for-profit) schools and hold the colleges accountable. Betsy DeVos is already well on her way to eliminating all three rules via executive action. The PROSPER Act would do the same, but go further, wiping away the authority of DeVos’s successors to regulate on these—and most other—issues, ever again. On the other side of the Hill, Senate Republicans have argued against Obama-era regulations as unfairly targeting for-profit colleges, and have instead been more interested recently in the notion of “risk sharing” applied to all colleges. When students who borrow leave a school, they carry their debt with them, and taxpayers have a clear interest in seeing that money returned, on time and in full. Yet when millions of students each year fail to repay their loans, colleges bear none of the risk; they got paid up front. Under most risk-sharing proposals, including the one Alexander offered up in a white paper, the department would fine a college for a portion of the expected-but-unpaid amount of students’ loan balances. As the November midterms approach, the chances of passing an HEA reauthorization approach zero. But the fight so far has clarified the issues and battle lines that we are likely to see next year when a new Congress, with possible new leadership in one or both houses, takes up the challenge. At least in theory, a risk-sharing proposal holds great appeal. It could help reclaim some of the taxpayer dollars lost to delinquent and defaulted student loans, and gives colleges an incentive to minimize debt and maximize students’ completion of valuable credentials. But nailing down the details is no small task, and risks the ire of the higher education lobby, bringing political peril to lawmakers in both parties. Foxx’s bill and the House Democrats’ alternative, the Aim Higher Act, both prove the challenge: the former makes modest changes to an existing policy and calls it risk sharing; the latter is filled with expensive, popular-with-the-base ideas like free community college and refinancing of student loan interest rates, but light on ideas to hold colleges and universities accountable for results. New policies around risk sharing, stricter standards for the current default rate measure, and the removal from the federal financial aid system of colleges that leave graduates with unaffordable amounts of debt could all force colleges to take the need for reform seriously. But past efforts to increase the regulation of colleges to ensure that taxpayer dollars are invested in better programs have taken a combination of educational crisis and political courage. Today, that commitment to countering the will of the higher education lobby appears to be lacking on Capitol Hill. If there’s one area of cross-party agreement in higher education, it’s this: the Free Application for Federal Student Aid, or FAFSA, is too long. It’s the oft-maligned form all students seeking federal student aid must fill out, requiring applicants to complete dozens of questions about their and their families’ financial circumstances. For many, that alone can prove an insurmountable barrier. According to one counseling organization, nearly half of low-income high school seniors may not complete a FAFSA at all. But while there’s universal and bipartisan agreement that the FAFSA is too long, agreement on how—and how much—to shorten it has been elusive. Foxx’s FAFSA simplification proposal is pretty minimal: optimizing the FAFSA for mobile phones, so applicants can fill out the form without access to a computer. Lamar Alexander has a more radical vision. While most applicants complete the FAFSA online—where some questions can be skipped based on previous answers, and tax information can be directly imported from tax returns—Senator Alexander can’t resist the prop of dropping a paper copy of the FAFSA to the floor to showcase its sheer length. A proposal he authored with Democratic Senator Michael Bennet a few years back would have put the FAFSA on a postcard, dropping it to just two questions: family size and family income. Other Democrats have proposed eliminating a smaller set of questions that would be unlikely to change most students’ aid awards—like questions about families’ assets, such as savings accounts and investment properties—and automatically granting more students the maximum eligible aid. Republicans say they want to streamline federal loans into one program. But while it would be a positive step to limit the burden on students and families to understand these complex financial products, it could be a net negative if those simplifications make college less affordable. While a mobile app has its benefits, the next HEA reauthorization should change not just how families fill out the form, but the very form itself. The questions on the form are part of a federal formula for determining who gets what aid, and how much. Drastically shrinking the form or removing questions not only limits the ability to make sometimes-meaningful distinctions between the wealth and income of different households, it also impacts what aid families qualify for. Moreover, if the FAFSA provides too little information, colleges or states that rely on the form may be motivated to create and use their own, separate applications—ones that might not be offered for free—making the process less simple, on balance. A middle ground, like the one charted in a budget proposal by President Obama, would eliminate some questions related to families’ assets that are hard to complete and have little effect on most students’ aid eligibility, and align the form with information collected through our taxes. For decades, American car buyers have been able to go to auto dealers and read a sticker affixed to vehicle windows with key disclosures mandated by the federal government. This information includes the manufacturer’s suggested retail price for the car, as well as performance metrics like miles per gallon, vehicle emissions, and safety ratings. In 2006, a commission headed by Education Secretary Margaret Spellings concluded that the federal government should provide higher education shoppers with equivalent information for colleges and universities. The metrics, such as the median income of graduates from specific universities and programs, would be derived by connecting data on individual student outcomes that the federal government has in its own databases. This would mean not only better information for prospective college students, but also less paperwork for colleges and universities in the long term. It would be a win for everybody—except for those institutions that would wind up looking below average on the metrics, especially expensive, smaller nonprofit colleges and universities. The trade association representing these institutions argued that the Spellings plan would be a violation of students’ privacy and in 2008 persuaded Congress to ban any administration from creating such a system. The lawmaker who led the efforts to impose the ban in the House was none other than Virginia Foxx. The Obama administration in its final years disclosed, for the first time, information on outcomes such as the typical earnings of students who graduate from a particular college or university—but only for federal grant and loan recipients, excluding a sizable portion of the student population. While that was a helpful advance, the specific information that would most help students, like earnings for graduates of particular programs at those colleges, can only be derived by lifting the congressional ban. Last year, a bill to do just that, the College Transparency Act, was introduced in both chambers. It quickly gained steam: a dozen senators evenly split across the parties signed on to the bill in the Senate, along with more than thirty Republicans and Democrats in the House. Foxx made sure that the legislation never became part of her PROSPER Act, but she had to muscle Republican members of her committee to do so. While the Senate has not acted on its version either, support for the measure keeps growing, with new cosponsors from both ends of the political spectrum jumping on board. Whether there’s an HEA reauthorization now or later—with Foxx running the show in the House or not—inclusion of the College Transparency Act has started to feel more likely even amid the uncertainty on other issues. Choice in the marketplace is generally considered a good thing, and there is certainly a lot of it in the federal student market. Currently, the Department of Education offers low- and middle-income students subsidized loans that don’t carry interest until after the student leaves school, and unsubsidized loans that accrue interest from day one and are available to all comers who ask for them. It also offers loans to graduate students, and loans to parents of students working toward an undergraduate degree or certificate. But too much choice can also present problems. When deciding on student loans, many prospective students and their parents struggle to understand—or even identify—the terms and benefits of each individual stream of federal dollars. Some of those loans carry relatively high interest rates and can present big risks; graduate loans are limited only by total tuition and living costs. And rather than provide the lowest-income parents of undergraduates with sufficient grant aid for their children, the federal government deems them eligible for significant amounts of federal loans they’ll likely never be able to repay. Republicans say they want to streamline federal loans into one program, with one type of loan each for undergraduates, graduate students, and parents. But while it would be a positive step to limit the burden on students and families to understand these complex financial products before they ever step foot on a college campus, it could be a net negative if those simplifications make college less affordable. Republican lawmakers have brought their simplification agenda to the forefront, obscuring the party’s other agenda: to reduce the amount of federal spending on higher education. For instance, Foxx’s HEA bill would consolidate all of the grants for low-income students, but without pooling the money to increase the grant proportionately. Cutting need-based grants from two programs to one means less scholarship funding to go around. And as proposed by both Foxx and Alexander, one loan to undergraduates means an end to the in-school interest benefit currently offered to low- and middle-income borrowers. Republican education leaders want to eliminate public service loan forgiveness and included a repeal in their proposed bill, arguing that it is costly and disproportionately benefits well-paid and high-debt borrowers like government lawyers. Repaying loans is also complicated. Currently, there are nine repayment options available to students, each carrying different terms, repayment options, and disadvantages and advantages for borrowers. Having so many choices puts borrowers at risk of ending up in a suboptimal plan. For instance, borrowers are automatically dumped into the shortest repayment plan, a ten-year standard schedule that does little to recognize the long-term nature of payoffs associated with higher education and likely contributes to the one million borrowers a year who default on their loans. Many advocates and researchers have instead made the case that one of those choices, income-driven repayment (IDR) plans, could help solve problems of delinquency and default. Under IDR, monthly loan repayments can’t exceed a fixed percentage of a borrower’s income—as low as $0 a month during unemployment—and if after twenty or twenty-five years that borrower’s earnings have been too low to fully pay off the loan, the balance owed is forgiven. But many students encounter logistical problems with IDR and fail to enroll or reenroll. Some have suggested making IDR the default—or even the only—repayment plan, with the federal government automatically calculating payments, much as it deducts taxes from paychecks. That could mean less confusion and a clearer path to affordable payments, which would be a welcome change for the low-earning borrowers most at risk of winding up in default on their loans. But it also means fewer options for the millions of borrowers enrolled in one of the department’s other plans, who may prefer greater certainty in their expected repayment; and it’s an expensive proposal when lower monthly payments and big loan forgiveness amounts are accounted for. Simpler isn’t always better for every borrower. In 2007, Congress created the Public Service Loan Forgiveness (PSLF) Program, which forgives any loan balances left after ten years of payments made through IDR for individuals who are working in the government or at a nonprofit. While the first handful of borrowers have only just received forgiveness, the unclear wording of the statute and subsequent regulations have left out to dry many borrowers who thought they would be eligible, like public service workers not in nonprofit organizations or public servants who enrolled in a repayment plan other than IDR. In recognition of the confusion, Congress this year funded a limited-time-only program for students who thought they would get loan forgiveness for their public service but learned too late that they’d been in the wrong repayment plan. Republican education leaders want to eliminate public service loan forgiveness and included a repeal in Foxx’s proposed bill, arguing that it is costly and disproportionately benefits well-paid and high-debt borrowers like government lawyers. But during the House’s markup, a Democratic congressman argued that the loan forgiveness program should be expanded, not eliminated, to cover farmers like the ones in his district. A vote on that amendment found two Republican defectors on the committee to join all seventeen Democrats. And signs suggest that this is one of the largest areas of concern among veterans’ and servicemembers’ groups, with even the Trump administration’s Department of Defense writing to Congress that the program is a key recruitment tool that shouldn’t be eliminated. With tensions running high over the future of the program, it’s clear that its elimination will be next to impossible—and that the public believes strongly in the mission of PSLF. Instead, lawmakers should focus on making the program implementable: limiting eligibility to clear-cut cases of public service jobs like teaching and government work, capping forgiveness benefits to ensure that taxpayers are protected, and improving outreach and applications to help more of the eligible borrowers who are less likely to know about the program access those benefits. Within both parties there is widespread recognition that more needs to be done to help Americans who aren’t aiming for four-year degrees but who do need some kind of postsecondary credential to make it in the modern economy. Many colleges would like to make these credentials even quicker to earn, by offering shorter programs that students can complete in as few as eight weeks, which currently aren’t eligible for federal student aid. To that end, House and Senate Democrats have proposed that Pell Grants should be expanded to those very short-term programs. House Republicans went even further, proposing to permit short-term programs access to federal loans as well as grants. The idea is aggressively supported by everyone from the community colleges that currently offer non-credit-bearing short-term programs to the Chamber of Commerce. But few have grappled with the fact that opening the federal spigot to short-term programs will likely lead to billions of dollars being spent on slickly marketed, low-quality programs, especially by for-profits, that are of questionable value in the workplace. The Democratic proposal would add data reporting requirements, but do little to guarantee a reasonable return on investment for the new programs. The Republican proposal would be even more costly, and do even less to protect students’ and taxpayers’ investments. One of the most radical innovations included in Foxx’s bill is an idea that actually came from the Obama administration. In 2015, the Department of Education announced an experiment known as EQUIP, which allowed a small group of colleges to outsource more than half of their programs to nonaccredited, unofficial educational providers like pricey high-tech coding boot camps that offer little financial aid and thus serve often as finishing schools for bachelor’s-degree graduates looking for a hard skill set to boost their earnings in the white-hot market for technical expertise. The experiment was led by then Under Secretary of Education Ted Mitchell, who described that the institutions participating in the experiment would be the “bankers” for the program. Since leaving the department, Mitchell has become the president of the lobbying association for colleges and universities. But what was a small-scale experiment in which only eight institutions were invited to participate—one that is still barely off the ground, with only a single college approved to disburse federal aid—apparently holds great appeal for Foxx’s office. PROSPER proposes to codify the experiment in law outright, creating an obvious blind spot in federal oversight: unqualified providers could offer a college education, without all the rigmarole of actually being a college. Aside from a perfunctory review of the contract between the institution and the provider, no independent accreditation would be required to verify the quality of the curriculum or the credentials of the faculty; nor would there be any assessment of the program’s financial viability to ensure that taxpayers wouldn’t be on the hook to discharge students’ loans if the program shuttered abruptly, as several have in recent years. As lawmakers approach the HEA reauthorization process anew in the next Congress, they must meet the significant risk these types of nontraditional programs present with hard and fast requirements that they either prove their worth to students or be denied access to taxpayer dollars altogether. Student debt presents a problem for students who don’t graduate, or who complete with low-value credentials that don’t let them earn enough to repay their debt—and a problem for the taxpayers who finance those loans, as well. Those problems will only be heightened as colleges struggling from enrollment declines find new ways to benefit from the gold rush for new types of credentials granted access to federal dollars. Another reform that has broad support in general but sparks disagreement over the particulars is so-called competency-based education (CBE). The idea of CBE is that instead of having to sit through classes for a set amount of time—which is how most college programs work—students can move at their own pace, often in online classes, and advance by showing mastery of specific knowledge and skills (“competencies”) on exams designed by subject-matter experts. They may also get credit for skills learned on the job by taking exams and building portfolios of their prior work that are judged by outside experts. CBE is a rapidly growing field, with more than 600 programs in operation or being developed today. And it’s an attractive concept next to traditional education, in which a passing grade doesn’t necessarily mean that students have truly learned the skills. To qualify for federal student aid, however, the programs must convert their structure to the time-based model through which Congress awards federal aid, and members of both parties want to change that. But CBE programs are not without risk: to taxpayers, because of the subjectiveness with which “competencies” are measured and then paid for, and to students, who may struggle with a format that leaves schedules loose and lets students languish longer in the program, accruing more debt along the way. A key question for lawmakers is how to adapt the existing federal aid system to accommodate and pay for these programs, without further damaging the higher education system. Today, most CBE programs convert their competencies to an estimation of credit hours, what one witness in a Senate hearing called the “currency of the U.S. higher education system,” to ensure that they’re financed comparably to traditional programs. Foxx would take an aggressive—some would say reckless—approach, making all CBE programs fully eligible for aid outside of the credit-hour system. A separate, bipartisan House bill would take a more thoughtful approach by allowing the department to pilot CBE programs with a few select schools before providing all such programs with access to taxpayer dollars outside of the current system. A CBE pilot could help avoid some of the hazards that come with letting colleges set their own standards for what amount of learning the federal government should pay full price for. But in last month’s committee meeting on the House side, a vote to include the pilot was rejected by Republicans, setting the stage for future fights about how quickly, not whether, to expand financial aid access to these programs. With the summer recess now here, passage of an HEA reauthorization looks near impossible, and this iteration of the PROSPER Act is destined to become a casualty of the legislative process. Moreover, internal politics, fights over who will become the next speaker of the House, and an inability to address immigration and the humanitarian disaster involving children and families at the border have placed higher education on a back burner. Still, the partisan battles that happen here will repeat themselves in the next go-around, and the thoughts and ideas contained in this bill will set the stage for future conversations around HEA reauthorization. Jared Bass is the senior counsel for education and strategy in the Education Policy Program at New America. Clare McCann is the deputy director for federal higher education policy in the Education Policy Program at New America.